Grace is an Internationally Certified Natural Henna Artist based in the San Francisco Bay Area, California. She was first introduced to henna by her local community in Fremont, California. Often a receiver of henna, she appreciated the art form and grew up learning about the different cultural customs surrounding the tradition. 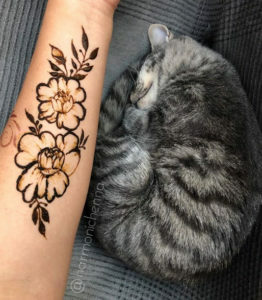 Being surrounded by henna, she learned that it is a unique art form that transcends cultural boundaries and is used in times of celebration. After attending Zentangle training and teaching her students in the classroom, she received henna from another henna artist in her community. She noticed that many of the patterns in Zentangle were present in henna. From there, she decided to try her hand at sharing the tradition of body adornment and celebration with others. 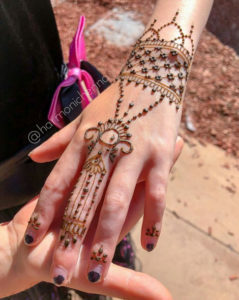 Her passion grew and Grace dedicated herself into her craft by educating herself on the cultural roots and history of henna and best practices through attending henna conferences, private lessons, self-study, and certifications. Grace is an elementary school teacher who loves traveling, rabbits, cooking, hula hooping, art, and helping others. 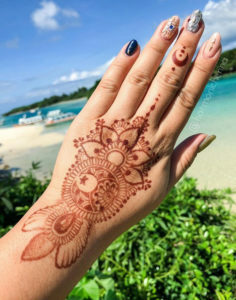 She loves that henna is traditionally used across many cultures as a way to adorn the body and connect with others.